Multiple sclerosis (MS) is a CNS autoimmune disease believed to be triggered by T cells secreting Th1-specific proinflammatory cytokines, such as GM-CSF. In the animal model of MS, experimental autoimmune encephalomyelitis (EAE), Th1 but not Th2 cells have been shown to induce disease; however, to date, no single encephalitogenic T cell-derived cytokine has been shown to be required for EAE onset. Because GM-CSF-deficient mice have been shown to be resistant to EAE following immunization with myelin self-Ag, we investigated the cellular source of the required GM-CSF and found that GM-CSF production by encephalitogenic T cells, but not CNS resident or other peripheral cells, was required for EAE induction. Furthermore, we showed that microglial cell activation, but not peripheral macrophage activation, was a GM-CSF-dependent process. Activation of microglial cells by the injection of LPS abrogated the GM-CSF requirement for EAE induction, suggesting that microglial cell activation is required for EAE onset. These data also demonstrate that GM-CSF is a critical Th1 cell-derived cytokine required for the initiation of CNS inflammation associated with EAE, and likely MS.
Clear evidence exists that both the human CNS autoimmune disease multiple sclerosis (MS)3 and its animal model experimental autoimmune encephalomyelitis (EAE), are initiated by CD4 T cells of the Th1 subtype, which secret proinflammatory cytokines. Because Th2 cells do not induce EAE, it is thought that at least one Th1 cytokine is essential for the onset of EAE; however, no such cytokine has been described. One candidate Th1 cytokine is GM-CSF, because mice deficient in GM-CSF were shown to be resistant to EAE induction following immunization with myelin oligodendrocyte glycoprotein (MOG) (1). However, this study did not identify the cellular source nor the function of the required GM-CSF. GM-CSF was first described as a factor important for the differentiation of hemopoietic cells into granulocytes and macrophages (2), although GM-CSF-deficient mice were not deficient in myeloid cell numbers (3). Cellular sources of GM-CSF include macrophages, mast cells, endothelium, fibroblasts, and T cells (4). Currently, GM-CSF is thought to be a critical proinflammatory cytokine important for infectious and tumor immunity, as well as the development of a number of inflammatory diseases and autoimmunity (4, 5). In EAE, the administration or overexpression of GM-CSF by encephalitogenic T cells resulted in more severe clinical disease (1, 6). One possible function of GM-CSF in EAE is the activation of local APCs, which include microglial cells located throughout the parenchyma of the brain and spinal cord, and blood-derived macrophages and dendritic cells located in the perivascular space surrounding blood vessels (7, 8, 9, 10, 11). The exact function(s) of microglial cells is not well understood, and their activation, which is also not well understood, is thought to play a role in the onset of both MS and EAE (12, 13, 14). In the normal CNS, microglial cells are described as being CD45low and express essentially undetectable levels of MHC class II, which is up-regulated following activation (15). In contrast to microglial cells, perivascular macrophages in the normal CNS exhibit an activated phenotype characterized by a high expression level of both CD45 and MHC class II (15, 16). In addition to GM-CSF, microglial cells can be activated through innate immune mechanisms, including LPS, which binds TRL4 (17, 18, 19, 20, 21). We were the first to show that microglial cells become activated in the CNS before both the onset of EAE clinical disease and the influx of peripheral macrophages into the CNS (22), suggesting that encephalitogenic T cells provide the factors required for microglial cell activation and that their activation is required for EAE onset. In this study, we determined the mechanism of action and the cellular source of GM-CSF in the onset of EAE. We found that GM-CSF, produced solely by encephalitogenic T cells, plays a key role in microglial activation and is sufficient to induce EAE. The proinflammatory effect of GM-CSF, however, may be bypassed by inoculation of TLR agonists intracranially (i.c.) and thus directly activating microglial cells. Thus, these cumulative data suggest that GM-CSF production by self-reactive T cells is a critical Th1 cytokine in MS pathogenesis, and that microglial cell activation is required for the onset of CNS autoimmunity. B10.PL (H-2u) and C57BL/6 (H-2b) mice were purchased from The Jackson Laboratory or bred locally in our colony. Mice deficient in GM-CSF (GM-CSF−/−) (H-2b) (23) were provided by Dr. J. Whitsett (Cincinnati Children’s Hospital, Cincinnati, OH). The myelin basic protein (MBP)-TCR transgenic mice specific for the MBP peptide Ac1-11 have been described previously (24). B10.PL-GM-CSF−/− (GM-CSF−/−) mice were produced in our breeding colony by backcrossing C57BL/6-GM-CSF−/− mice onto B10.PL for two generations, and then were crossed with the MBP-TCR transgenic B10.PL mice to generate MBP-TCR-GM-CSF−/− mice (MBP-GM-CSF−/−) (H-2u). B10.PL-GM-CSF+/+ mice had identical EAE disease courses to B10.PL mice purchased from The Jackson Laboratory. (B10.PL × C57BL/6)F1 mice were also produced in our colony. All animal procedures were approved by the Medical College of Wisconsin Institutional Animal Care and Use Committee. Encephalitogenic T cell lines were generated from the spleens of MBP-TCR or MBP-GM-CSF−/− transgenic mice as described previously (24) with modifications. Briefly, total splenocytes were depleted of B cells by panning, and 10 × 106 cells were cocultured with 20 × 106 inactivated splenocytes from B10.PL mice with 5 μg/ml Ac1-11. Four days before adoptive transfer, the MBP transgenic T cell lines were reactivated with Ac1-11. MHC class I-mismatched chimera mice were generated as described previously (22) by transplanting B10.PL mice with BM cells from (B10.PL × C57BL/6)F1 mice. BM cells of donor origin were differentiated from recipient cells by the expression of the MHC class I molecule H-2Kb. EAE was induced in the chimera mice at 8–10 wk post-BM transplantation. Sublethally irradiated (360 rad) 7- to 8-wk-old male or female B10.PL or BM chimera mice were i.v. injected with 1 × 106 encephalitogenic T cells (24). Individual animals were assessed daily for symptoms of EAE and scored using a scale from 0 to 5 as follows: 0, no disease; 0.5, weak tail or mild hind limb ataxia; 1, limp tail and/or hind limb ataxia; 2, hind limb paresis; 3, hind limb paralysis; 4, hind and fore limb paralysis; 5, death. For some experiments, LPS (Sigma-Aldrich), CpG oligodeoxynucleotide (ODN) (GCTAGACGTTAGCGT) (ODN1555) (25), control ODN (GCTAGATGTTAGCGT (ODN1612) (25), or PBS was injected i.c. on the day of EAE induction. For quantitation of GM-CSF by real-time PCR, total RNA was isolated from the spinal cords of PBS-perfused mice on the indicated days following EAE as described previously (26). RT-PCR was used to detect GM-CSF synthesis by CD4+ T cell lines generated from MBP-TCR wild-type (WT) and MBP-GM-CSF−/− mice as described previously (27). Primer sequences for GAPDH and hypoxanthine phosphoribosyltransferase (HPRT) have been described previously (26, 27). The sense primer for GM-CSF was 5′-TTTACTTTTCCTGGGCATTG-3′; the antisense primer was 5′-TAGCTGGCTGTCATGTTCAA-3′. Total mononuclear cells were isolated from the CNS of B10.PL or BM chimera mice with and without EAE using Percoll gradients as described (28). Total cell number was determined using a hemocytometer with viability assessed by trypan blue exclusion. For analysis of microglial cell, peripheral macrophage, and lymphocyte populations, cells were stained with anti-CD45-PE, anti-CD11b-CyChrome (both obtained from eBioscience), anti-H-2Kb-FITC (BD Biosciences) and anti-MHC class II-biotin (BioLegend), or anti-CD86-biotin (BioLegend), or anti-CD40-biotin (BioLegend), or anti-Vβ8.2-biotin (BioLegend) combined with streptavidin-allophycocyanin-Cy7 (BioLegend). FcRs were blocked with a mAb specific for mouse FcR (2.4G2). For analysis of activation markers and cytokine expression, CNS mononuclear cells were stained with anti-CD4-FITC and anti-Vβ8.2-biotin combined with streptavidin-PE-Cy5 (all obtained from BD Biosciences) and anti-CD25-PE or anti-CD69-PE (both from eBioscience). For intracellular cytokine staining, CNS mononuclear cells were first stained with anti-CD4 and anti-Vβ8.2 before fixation and permeabilization using the Cytofix/Cytoperm kit from BD Pharmingen, and then stained with anti-IFN-γ-PE (BD Pharmingen), or anti-GM- CSF-PE (BioLegend), or an appropriate isotype-matched control mAb (BD Pharmingen). Phenotype analysis was performed on a LSR II (BD Biosciences) using three- or four-color flow cytometry. Ab incubations were conducted on ice for 15–20 min, and the cells were fixed in 1% paraformaldehyde. Mononuclear cells were isolated from the CNS of three to four WT and μMT mice at peak of disease following EAE induction. FcR were blocked with anti-mouse FcR (2.4G2), followed by staining with the anti-mouse mAb CD4-FITC, CD11b-PE, and Vβ8.2-biotin followed by SA-PE-Cy5. CD11b− cells were gated for CD4 and sorted into Vβ8.2+ and Vβ8.2− populations using a FACSAria Cell-Sorting System (BD Biosciences). For labeling of proliferating cells in vivo, groups of four to five WT or GM-CSF−/− mice with EAE on day 14 were injected i.p. with 1 mg of BrdU (Sigma-Aldrich) 14 h before mononuclear cell isolation. The cells were stained with anti-CD4-PE and anti-Vβ8.2-biotin combined with streptavidin-PE-Cy5 (all obtained from BD Pharmingen) before staining for BrdU using the BrdU flow kit from BD Biosciences using anti-BrdU-FITC (BD Biosciences). For in vitro proliferation, BrdU was added to cultures at a final concentration of 10 μM 14 h before staining for BrdU. On day 15 following EAE induction, mice were perfused intracardially and spinal cords were removed and fixed overnight at 4°C in paraformaldehyde-lysine-periodate fixative, followed by infusion with sucrose, and snap frozen. Coronal sections (10 μM) were stained with anti-CD11b-FITC (eBioscience) or anti-TCRβ-FITC (BioLegend) as described previously (29). It was reported that GM-CSF-deficient mice were not susceptible to EAE, but neither the source of the required GM-CSF nor its tissue localization were determined (1). To assess whether GM-CSF production was required in the CNS, we first examined the levels of GM-CSF expression in the spinal cord of mice with EAE by real-time RT-PCR. We found that on day 0, GM-CSF message was expressed in the CNS at a very low almost undetectable level (Fig. 1⇓A). However, in mice showing the first signs of EAE (day 7; Fig. 1⇓B) the levels increased over a 1000-fold (Fig. 1⇓A). By the peak of disease on day 15 (Fig. 1⇓B), the level of GM-CSF message was reduced and steadily declined over the EAE disease course to pre-EAE levels on day 36 (Fig. 1⇓A). 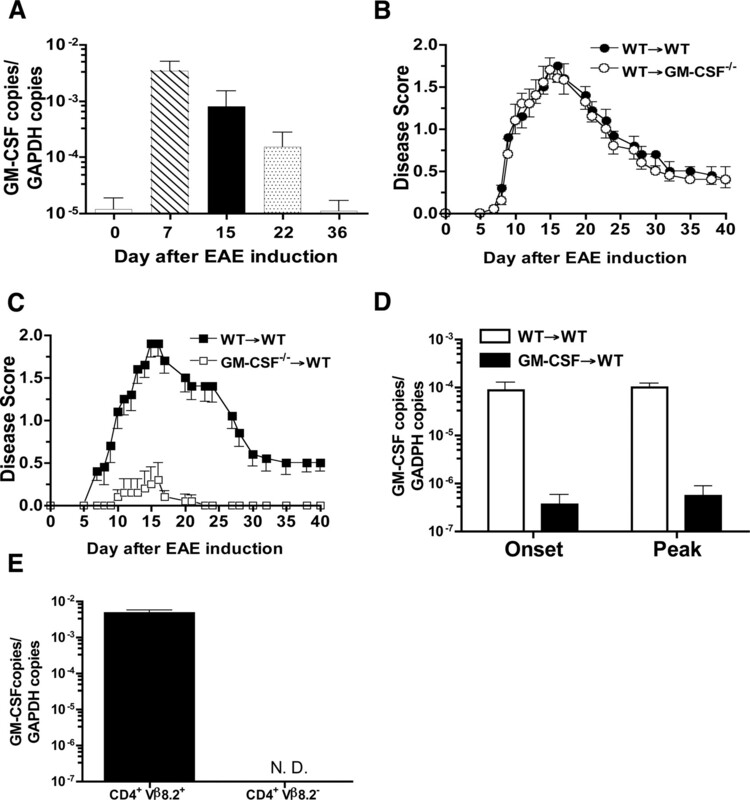 GM-CSF production by encephalitogenic T cells is required for the development of EAE. A, D, and E, The level of mRNA for GM-CSF was determined by real-time PCR and are presented as a ratio of the number of GM-CSF copies to the number of GAPDH copies with the SE shown. Data shown are representative of two experiments. A, GM-CSF expression in the spinal cord of mice on day 0, 7, 15, 22, and 36 after EAE induction by WT T cells in WT mice. D, GM-CSF expression in the spinal cord on the day of EAE onset and peak of disease in EAE in WT mice induced by either WT (□) or GM-CSF−/− (▪) encephalitogenic T cells. E, EAE was induced in WT mice, and 14 days later total mononuclear cells were isolated and stained with a mAb specific for CD11b, CD4, and Vβ8.2. CD11b− cells were gated and CD4+Vβ8.2− T cell populations were obtained by FACS. B and C, EAE was induced by the adoptive transfer of WT T cells into B10.PL WT (•, ▪) or GM-CSF−/− mice (○) or by the adoptive transfer of MBP-GM-CSF−/− T cells into WT mice (□). Data shown are the average daily score of 10 mice from two experiments. N.D., Not detected. We next determined whether the cellular source of the GM-CSF was from the transferred encephalitogenic T cells or was produced by endogenous cells. To accomplish this, we induced EAE in WT and GM-CSF−/− mice using MBP-TCR WT encephalitogenic T cells and saw no difference in disease (Fig. 1⇑B), suggesting that the required GM-CSF was produced by the encephalitogenic T cells and not by an endogenous source. To confirm this, we induced EAE in WT mice using either WT MBP-TCR or MBP-GM-CSF−/− T cells and found that EAE was inhibited when disease was induced with MBP-GM-CSF−/− encephalitogenic T cells (Fig. 1⇑C). A comparison of disease parameters in EAE induced by WT or GM-CSF−/− T cells is provided in Table I⇓, which clearly demonstrates that clinical disease between the two groups is highly significantly different (p < 0.0001). By intracellular cytokine staining (Fig. 2⇓A) and RT-PCR (Fig. 2⇓G), we confirmed that the MBP-GM-CSF−/− T cells were deficient in GM-CSF. Whereas, the WT encephalitogenic T cells showed GM-CSF production by both methods (Fig. 2⇓, A and G, respectively). To examine whether other cellular sources of GM-CSF besides encephalitogenic T cells exist in the CNS during EAE, we measured GM-CSF message in the spinal cord of WT mice in which EAE was induced with either WT or GM-CSF−/− T cells. The level of GM-CSF message in mice transferred with GM-CSF−/− T cells at both the onset and peak of EAE was >100-fold lower than when WT T cells were transferred (Fig. 1⇑D). We also sorted CD4+Vβ8.2+ encephalitogenic and CD4+Vβ8.2− nonencephalitogenic T cells from the CNS of mice with EAE induced by WT T cells and were able to detect GM-CSF by real-time PCR (Fig. 1⇑E) and intracellular cytokine staining in only the encephalitogenic T cell population (data not shown). These data demonstrate that the primary GM-CSF-producing cells in the CNS during EAE are encephalitogenic T cells. Comparison of proliferation and cytokine production by WT and GM-CSF−/− MBP-specific T cells in vitro and in the CNS of mice with EAE. WT and GM-CSF−/− T cells on the day of EAE induction (A, C, E, and G) were examined for the expression of GM-CSF (A) or IFN-γ (C) using two-color immunofluorescence, staining for cell surface CD4 (x-axis) and intracellular IFN-γ (y-axis) or GM-CSF (y-axis). The cells were gated on CD4, and the percentage of cells expressing either cytokine is given in the upper right quadrant. E, Cell proliferation was measured by pulsing with BrdU 14 h before staining for cell surface Vβ8.2 and CD4 and incorporated BrdU. Data shown are gated on CD4+ cells with the horizontal bar indicating positive staining. The number above the bar is the percentage positive. G, RT-PCR were as described in Materials and Methods using cDNA prepared from total RNA isolated from WT MBP-T cells (left lane) or MBP-GM-CSF−/− T cells (right lane) for GM-CSF (top gel) or the housekeeping gene HPRT (bottom gel). B, D, F, and H, Total mononuclear cells were isolated from the CNS of mice 14 days following EAE induction with either WT or GM-CSF−/− MBP-specific T cells and analyzed as described above for intracellular cytokine expression of GM-CSF (B) or IFN-γ (D) and for BrdU incorporation (F) gating on CD4+Vβ8.2+ cells. The same cells were analyzed for CD25 and CD69 (H) expression. The solid line represents staining with specific Ab, and the dotted line represents background staining using an isotype-matched control. For isolation of mononuclear cells from the CNS, brains and spinal cords from groups of 4–5 mice were pooled. All data shown are one representative experiment of three. In addition to a lack of GM-CSF production, the inability of the MBP-GM-CSF−/− T cell lines to induce EAE could be due to alterations in phenotype rendering them nonencephalitogenic. Because encephalitogenic T cells are Th1 cells, we confirmed that both WT and GM-CSF-deficient T cell lines produced similar levels of IFN-γ by intracellular cytokine staining on the day of EAE induction (Fig. 2⇑C). Also, because EAE induction is characterized by an expansion of encephalitogenic T cells in the CNS, we also examined the proliferation rate of each cell line and found that 29% of WT and 28% of the MBP-GM-CSF−/− T cells were undergoing proliferation at the time of EAE induction (Fig. 2⇑E). Using semiquantitative real-time PCR, we found no difference in the production of IFN-γ, TNF-α, lymphotoxin, IL-4, and IL-5 in the two cell lines (data not shown), demonstrating that the ability to produce GM-CSF is not required for the in vitro Th1 priming of the MBP-T cell lines and further confirms a role for GM-CSF production by the encephalitogenic T cells. Another possibility for why GM-CSF-deficient T cells were unable to promote EAE induction is that they were unable to migrate into the CNS and expand. To examine this question, we isolated total mononuclear cells from the CNS 14 days after EAE induction and analyzed the phenotype of the Vβ8.2+CD4+ encephalitogenic T cells. We were able to detect CD4 T cells in both sets of mice, and, as expected, the MBP-GM-CSF−/− T cells were unable to produce GM-CSF as compared with WT T cells, of which 7.8% produced GM-CSF (Fig. 2⇑B). In addition, we found that 44% fewer MBP-GM-CSF−/− T cells were producing IFN-γ as compared with WT (Fig. 2⇑D). Similarly, the number of MBP-GM-CSF−/− T cells undergoing proliferation was 43% lower than the WT T cells (Fig. 2⇑F). Table II⇓ contains the mean values and statistical analysis from three separate experiments performed from which Fig. 2⇑, A–F, are one representative experiment. Although changes in IFN-γ production and proliferation were observed, there were no differences in the level of the activation markers CD25 and CD69 between the two sets of T cells (Fig. 2⇑H). These data indicate that MBP-GM-CSF−/− T cells can migrate into the CNS, produce cytokines, proliferate, and maintain an activated phenotype, suggesting that GM-CSF is not required for encephalitogenic T cell function but rather is having a direct effect in the CNS. It has been suggested that microglial cell activation is important for the onset of EAE (13), but this has never been confirmed phenotypically; and because GM-CSF has a strong biological effect on microglial cells promoting their differentiation (9, 10, 30), we reasoned that GM-CSF was driving microglial cell activation before EAE induction. To specifically examine microglial cell activation, we generated MHC class I-mismatched BM chimeras by transplanting B10.PL mice (H-2u) with BM from H-2uxb donor mice. We have used this method to distinguish recipient microglial cells (H-2u) from peripheral macrophages (H-2uxb) that migrate into the CNS during EAE by lack of H-2Kb expression (22). The extent of microglial cell activation at the peak of clinical disease was determined by their up-regulation of CD45, an established criteria that we have confirmed (15, 22). When EAE was induced in the chimera mice with WT T cells, 40% of the total CD11b+H-2Kb− microglial cell population (rectangular gate) had up-regulated CD45 (CD45high) (Fig. 3⇓A), as compared with 4% when EAE was induced with MBP-GM-CSF−/− T cells (Fig. 3⇓A). This dramatic difference was also reflected in a significant change in the absolute number of CD45high microglial cells, with 57 ± 5 × 103 cells having this phenotype when EAE was induced with WT T cells and only 7 ± 2 × 103 cells when GM-CSF-deficient T cell were used (Table III⇓). The lack of microglial cell activation in the absence of encephalitogenic T cell-derived GM-CSF is further reflected by the larger number of resting microglial cells from 108 ± 11 × 103 to 181 ± 23 × 103 in the absence of GM-CSF production by encephalitogenic T cells (Table III⇓). Upon examination of the total CD11b+ population in the presence of GM-CSF, resting microglial cells were 32% and activated microglial cells were 14% of the cells (Fig. 3⇓C). These levels were 63 and 3%, respectively, in the absence of GM-CSF (Fig. 3⇓C). The difference in the absolute number and percentage of activated and resting microglial cells was statistically significant between the two groups (Table III⇓ and Fig. 3⇓C). Thus, in the absence of GM-CSF, the majority of CD11b+ cells were of microglial cell in origin, indicating a lack of infiltration of peripheral macrophages. This is demonstrated by the significant reduction in the absolute number (Table III⇓) and percentage (Fig. 3⇓C) of peripheral macrophages present in the CNS of mice at peak of disease in the absence of GM-CSF as compared with the WT control. 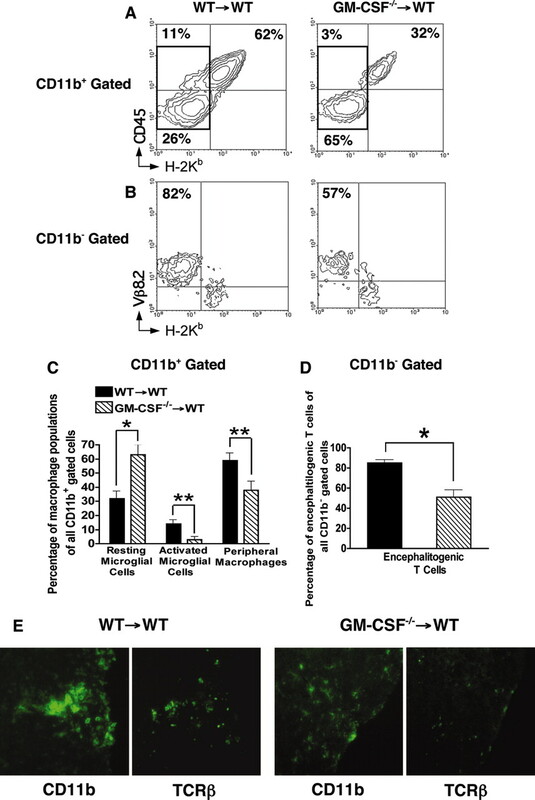 Histological analysis confirmed that CD11b+ microglia/macrophages were reduced in inflammatory lesions in the spinal cord of mice when EAE was induced with GM-CSF−/− T cells, as compared with WT MBP-specific T cells (Fig. 3⇓E). GM-CSF-deficient MBP-specific T cells have an impaired ability to activate microglial cells, recruit macrophages from the periphery, and expand in the CNS during EAE. MHC class I BM chimera mice were generated by transplanting B10.PL mice with BM cells from (B10.PL × C57BL/6)F1 mice. BM cells of donor origin were differentiated from recipient cells by the expression of the MHC class I molecule H-2Kb. EAE was induced in the chimera mice by the adoptive transfer of either WT or GM-CSF-deficient MBP-specific T cells. Ten days later, at the peak of disease, total mononuclear cells were isolated from the CNS of groups of 4–5 mice, the cells were pooled and analyzed for the expression of CD11b, CD45, H-2Kb, and Vβ8.2 using four-color cytometry. A, The CD11b+ gated cells were analyzed for the expression of H-2Kb (x-axis) and CD45 (y-axis). The percentage of CD45lowH-2Kb− resting microglial cells, CD45highH-2Kb− activated microglial cells, and CD45highH-2Kb+ peripheral macrophages is indicated in the lower left, upper left, and right quadrants, respectively. The rectangular gates indicate the population of CD11b+H-2Kb− microglial cells that was further analyzed for the expression of the activation markers MHC class II, CD86, and CD40 in Fig. 4⇓. B, CD11b− gated cells were analyzed for the expression of H-2Kb (x-axis) and Vβ8.2 (y-axis), and the percentage of Vβ8.2+H-2Kb− encephalitogenic T cells are indicated in the upper left quadrants. C and D, The average ± SE of three separate experiments is shown for the percentage of resting microglial cells, activated microglial cells, and peripheral macrophages of all CD11b+ gated cells (C), or encephalitogenic T cells in the CD11b− gated cells (D). ∗ and ∗∗, A statistically significant difference (p < 0.05 and p < 0.01, respectively) in the percentage of the specified cell populations isolated from the CNS of chimera mice with EAE induced by WT vs GM-CSF-deficient MBP T cells. E, On day 15 after EAE induction with either WT or GM-CSF−/− T cells, spinal cords were isolated and coronal 10 μM serial sections of the lumbar spinal cord were generated and stained with FITC-conjugated mAbs specific for CD11b or TCR-β and analyzed by immunofluorescence. Original magnification, ×200. Data shown are representative of two mice. Because both the number of activated microglial cells and peripheral macrophages are reduced in the CNS in the absence of GM-CSF, this represents a reduction in the number of APC able to activate and sustain the encephalitogenic T cell population. Indeed, in the absence of GM-CSF, the absolute number of CD11b−H-2Kb−Vβ8.2+ encephalitogenic T cells was significantly reduced from 62 ± 11 × 103 in the WT mice to 18 ± 7 × 103 cells in the GM-CSF-deficient mice (Table III⇑). Of the total CD11b− lymphocyte population (Fig. 3⇑, B and D), the percentage of encephalitogenic T cells decreased from 82% in the WT control to 50% in the absence of GM-CSF (Fig. 3⇑D). The reduction in the number of encephalitogenic T cells is reflected in the clinical score at the peak of disease, which was reduced from 2.1 to 0.4 (Table III⇑). As with CD11b+ microglia/macrophages, the number of αβ T cells was also reduced in the spinal cord inflammatory lesions when EAE was induced with GM-CSF−/− T cells (Fig. 3⇑E). To further confirm the lack of microglial cell activation in the absence of GM-CSF, we examined the expression of MHC class II and the costimulatory molecules CD86 and CD40, whose cell surface expression increase upon activation (9, 10, 22). We found that when EAE was induced with WT encephalitogenic T cells, 35% of the CD11b+H-2Kb− microglial cells expressed MHC class II (Fig. 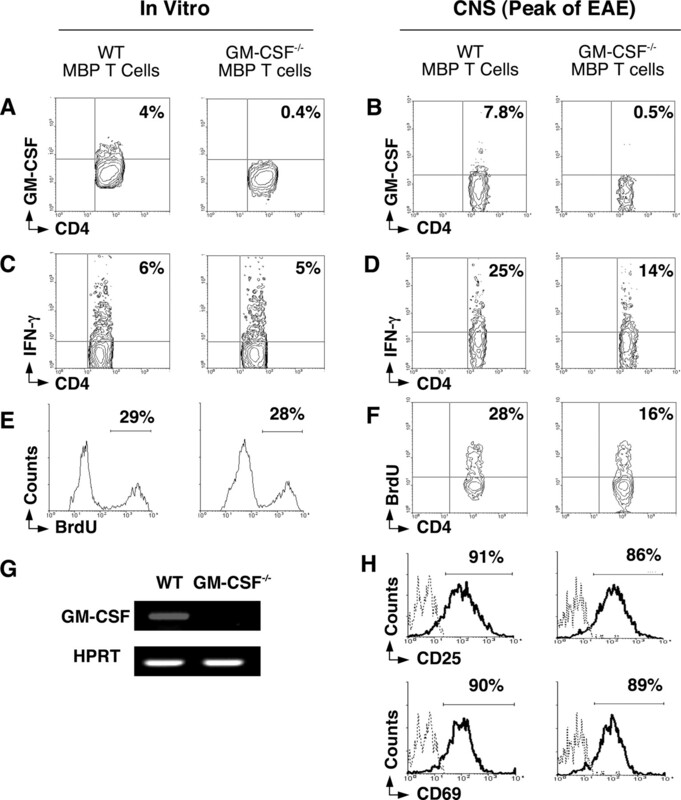 4⇓A), whereas only 12% were positive when MBP-GM-CSF−/− T cells were used (Fig. 4⇓B). Because MHC class II up-regulation could be due to the production of IFN-γ by the T cells (Fig. 2⇑), we also examined their expression of CD86 and CD40 and found that, using WT T cells, 17% of the microglial cells expressed CD86 and 10% expressed CD40 (Fig. 4⇓A), whereas the transfer of MBP-GM-CSF−/− T cells did not result in an increased expression of either costimulatory molecule (Fig. 4⇓B). The cumulative data from three experiments is shown in Fig. 4⇓E, with the expression of the three activation markers being significantly different between the two experimental groups. Activation of microglial cells in the CNS during EAE is substantially reduced in the absence of GM-CSF production by MBP-specific T cells, whereas the activation status of peripheral macrophages is not altered. EAE was induced in MHC class I BM chimera mice by the adoptive transfer of either WT or GM-CSF-deficient MBP-specific T cells (same as Fig. 3⇑). Ten days later, total mononuclear cells were isolated from the CNS of groups of 4–5 mice, the cells were pooled and analyzed for the expression of CD11b, H-2Kb, CD45, and MHC class II or CD86 or CD40 using four-color cytometry. A and B, CD11b+H-2Kb −microglial cells were gated as shown by rectangular gates in Fig. 3⇑A and analyzed for the expression of MHC class II, CD86, and CD40. C and D, CD11b+H-2Kb+CD45high gated peripheral macrophages were analyzed for MHC class II, CD86, and CD40 expression. A–D, The solid line represents staining with specific Ab and the dotted line represents background staining using an isotype-matched control. The horizontal bar indicates positive staining and the number above the bar is the percentage positive. E, The average ± SE of three separate experiments is shown for the percentage of cells positive for MHC class II, CD86, or CD40 expression of all CD11b+H-2Kb× gated microglial cells on the peak of EAE (day 10) induced by adoptive transfer of WT or GM-CSF−/− MBP T cells. ∗∗, A statistically significant difference (p < 0.01) in the percentage of positive cells isolated from the CNS of chimera mice with EAE induced by WT vs GM-CSF-deficient MBP T cells. Even though microglial cell activation was inhibited following the transfer of MBP-GM-CSF−/− T cells, peripheral macrophages did migrate into the CNS and accumulate (Fig. 3⇑, C and E), and although there numbers were decreased, the expression of the activation markers MHC class II, CD86, and CD40 were identical in the two sets of mice (Fig. 4⇑, C and D), indicating that GM-CSF is not required for macrophage activation. These cumulative data imply that GM-CSF production by encephalitogenic T cells facilitates CNS inflammation associated with EAE by promoting the activation of microglial cells, the recruitment of peripheral macrophages, and the expansion of encephalitogenic T cells. Because GM-CSF-deficient encephalitogenic T cells failed to activate microglial cells in the CNS and induce EAE, we next determined whether nonspecific activation of CNS local APC, including microglial cells, could override the GM-CSF requirement. Because LPS is known to activate microglial cells through TRL4 (17, 18), we delivered the LPS directly to the CNS by i.c. injection on the day of EAE induction. When mice were injected with 10 μg of LPS and WT encephalitogenic T cells (WT/LPS→WT), EAE was exacerbated with an earlier onset and a delayed and an attenuated disease recovery, as compared with the control mice not receiving LPS (WT→WT) (Fig. 5⇓A). 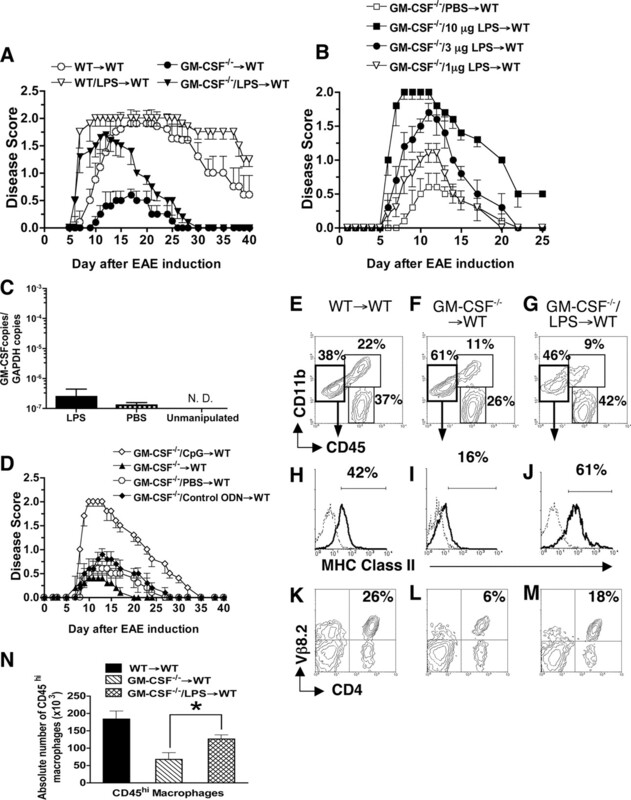 When EAE was induced with GM-CSF-deficient T cells, we found that a single i.c. injection of LPS restored the ability of GM-CSF-deficient T cells (GM-CSF−/−/LPS→WT) to induce EAE (Fig. 5⇓A), with EAE clinical disease having a earlier onset and greater severity than when LPS was omitted (GM-CSF−/−→WT) (Fig. 5⇓A). Table IV⇓ shows the statistical analysis of relevant EAE disease parameters in the four groups of mice in Fig. 5⇓A. Activation of microglial cells by i.c. administration of LPS overrides the requirement for encephalitogenic T cell production of GM-CSF. A, EAE was induced in WT B10.PL mice by the adoptive transfer of either WT (○, ▿) or GM-CSF-deficient (•, ▾) T cells. Some mice also received an i.c. injection of LPS (10 μg/mouse) at the same time (▿,▾). B, EAE was induced in WT mice with GM-CSF−/− T cells and on the same day were i.c. injected with PBS (□) or 1 (▿), 3 (•), or 10 (▪) μg of LPS. C, WT B10.PL mice were i.c. injected with LPS (10 μg) or PBS or were unmanipulated. Twenty-four hours later, expression of GM-CSF was determined in the spinal cord by real-time PCR. N. D., Not detected. Data shown are one representative experiment of two. D, EAE was induced in WT mice with GM-CSF−/− T cells and on the same day were i.c. injected with CpG ODN (⋄), control ODN (♦), PBS (○), or nothing (▴). A, B, and D, The daily average EAE score of 4–5 mice per group is shown for one representative experiment of two. E–M, Total CNS mononuclear cells were isolated at the peak of disease on day 14 after EAE induction with either WT or GM-CSF−/− T cells with or without i.c. injection of LBS, and stained for the expression of CD45, CD11b, and MHC class II or CD4 and Vβ8.2 and analyzed by flow cytometry. Data shown are one representative experiment of two. E–G, CD45 is shown on the x-axis and CD11b on the y-axis. The boxes represent gating for CD11b+CD45low microglial cells, CD11b+CD45high activated microglial cells and peripheral macrophages, and CD11b−CD45+ lymphocytes, with the percentage of cells in each gate given. H–J, MHC class II expression of the CD11b+CD45low gated microglial cells is shown. K–M, Total CNS mononuclear cells were analyzed for the expression of CD4 (x-axis) and Vβ8.2 (y-axis), with the percentage of double-positive encephalitogenic T cells indicated. N, The absolute number of CD45high macrophages was calculated by determining the total number of mononuclear cells isolated from the CNS of individual mice and multiplying by the percentage of CD11b+CD45high cells. The average of three separate experiments ± SE is shown. ∗, A statistically significant difference (p < 0.05) in the absolute number of CD45high macrophages isolated from the CNS of chimera mice with EAE induced by GM-CSF-deficient MBP T cells with or without i.c. LPS injection. The ability of LPS to circumvent the requirement for GM-CSF production by encephalitogenic T cells was dose-dependent, with 10 μg being the optimal dose (Fig. 5⇑B). As a control, we injected PBS i.c., which resulted in a marginal enhancement of EAE disease. However, this trauma effect was not as robust as LPS injection. Using real-time PCR, we showed that i.c. administration of LPS injection into the CNS did not induce GM-CSF production greater than the trauma of a PBS injection (Fig. 5⇑C). Comparison with Fig. 1⇑D shows that GM-CSF induced by trauma was 1000-fold lower than that expressed during EAE. From these data, we conclude that the LPS effect is GM-CSF independent. We also examined whether signaling through TLR9, which binds to a central unmethylated CpG dinucleotide portion of bacterial DNA, could also circumvent the GM-CSF requirement. As shown in Fig. 5⇑D, injection of CpG, a synthetic ODN mimic of bacterial DNA, but not a control ODN, was also able promote the induction of EAE in the absence of GM-CSF production by encephalitogenic T cells. Similar to Fig. 5⇑B, injection of PBS resulted in a slight increase in EAE severity as compared with no i.c. injection (Fig. 5⇑D). The data suggest that signaling through multiple TLR ligands can drive the induction of EAE in the absence of GM-CSF production by encephalitogenic T cells. We next determined whether the LPS treatment altered the nature of the inflammatory infiltrate 14 days after EAE induction. When EAE was induced with WT encephalitogenic T cells (WT→WT), the CD11b+CD45low microglial cells represented 38% (Fig. 5⇑E) of the total cell population of which 42% expressed MHC class II (Fig. 5⇑H). In the same mice, the CD4+Vβ8.2+ encephalitogenic T cells represented 26% of the total cell population (Fig. 5⇑K). In contrast, when EAE was induced with GM-CSF-deficient T cells (GM-CSF−/−→WT), the CD11b+CD45low microglial cell population constituted 61% of all mononuclear cells (Fig. 5⇑F) of which only 16% expressed MHC class II (Fig. 5⇑I). This lack of microglial cell activation is reflected by the reduced percentage of encephalitogenic T cells present in the CNS to 6% (Fig. 5⇑L). When LPS was administered along with the transfer of GM-CSF-deficient T cells (GM-CSF−/−/LPS→WT), the number of microglial cells was 46% of total CNS mononuclear cells (Fig. 5⇑G) of which 61% expressed MHC class II (Fig. 5⇑J). The administration of LPS increased the percentage of encephalitogenic T cells to 18% (Fig. 5⇑M). This reduced percentage as compared with the WT control (Fig. 5⇑K) is consistent with a less severe EAE disease course (Fig. 5⇑A; WT→WT vs GM-CSF−/−/LPS→WT). Because the injection of LPS did not increase the percentage of CD11b+CD45high macrophages in the CNS when EAE was induced by GM-CSF-deficient encephalitogenic T cells (Fig. 5⇑, F and G; upper right gate), we calculated the absolute number for this cell population to determine whether LPS administration resulted in accumulation of macrophages in the CNS. We found that LPS injection lead to a significant (p < 0.05) increase in the absolute number of CD45high macrophages in the CNS (Fig. 5⇑N; GM-CSF−/−→WT vs GM-CSF−/−/LPS→WT). However, the absolute number of macrophages was still lower than when EAE was induced with WT encephalitogenic T cells (Fig. 5⇑N; WT→WT vs GM-CSF−/−/LPS→WT). This observation was consistent with a less severe disease on day 14 (Fig. 5⇑A). Thus, activation of CNS local APC by LPS circumvented the requirement for encephalitogenic T cell-derived GM-CSF and resulted in microglial cell activation, accumulation of peripheral leukocyte in the CNS, expansion of autoreactive T cells, and the development of EAE. In this study, we show that the activation of local APC, driven by either encephalitogenic T cell production of GM-CSF or by LPS, is an important event in the CNS required for the development of EAE. We found that GM-CSF production was important for the effector functions of encephalitogenic T cells being required for microglial cell activation, recruitment of peripheral macrophages, expansion of encephalitogenic T cells, and the development of EAE clinical symptoms. It is now clear that GM-CSF is an important regulator of inflammation associated with both host defense to infection and autoimmunity (4). In particular, GM-CSF regulates granulocyte and macrophage lineage cell number and activation (4). Outstanding questions regarding the biological activities of GM-CSF in any particular inflammatory process are the cellular source and target of the cytokine. In EAE induced by immunization with MOG, it was reported that GM-CSF-deficient mice were resistant to disease induction and that anti-GM-CSF therapy ameliorated disease (1). Disease resistance was likely due to inefficient T cell priming in the periphery to the MOG peptide due to an absence of GM-CSF in the lymph node. In this situation, the cellular source of the GM-CSF would not likely be from the encephalitogenic T cells; whereas the administration of anti-GM-CSF after disease onset was most likely having a direct effect in the CNS. In our study, we used an adoptive transfer model of EAE using MBP-TCR transgenic T cells, so that we could circumvent the requirement for GM-CSF in the in vivo priming of autoreactive T cells. When GM-CSF−/− MBP-specific T cells were primed in the presence of WT splenocytes as a source of GM-CSF, we found no difference between WT and GM-CSF−/− encephalitogenic T cells in their ability to proliferate and produce proinflammatory cytokines (Fig. 2⇑). This is consistent with a study by Wada et al. (31), who showed that reduced recall responses of Ag-primed T cells from GM-CSF−/− mice were restored if restimulated in the presence of WT dendritic cells. Thus, T cells themselves do not need to produce GM-CSF for Ag-specific priming. When EAE was induced with WT T cells in GM-CSF-deficient mice, EAE clinical disease was unaltered (Fig. 1⇑B). In contrast, when EAE was induced in WT mice with GM-CSF−/− T cells, EAE clinical disease was blocked (Fig. 1⇑C). These data clearly demonstrate that production of GM-CSF by encephalitogenic T cells is necessary and sufficient for EAE induction. Because GM-CSF can be produced by a variety of cell types (4), it is interesting that only T cell-derived GM-CSF is required for EAE disease onset. We next examined the biological action of GM-CSF on the CNS microenvironment and found that it was required for early microglial cell activation (Fig. 3⇑). Previously, we have reported the kinetics of microglial activation during the EAE clinical disease course (22). Specifically, we showed that microglial activation and induction of their proliferation occurred before clinical disease onset and the migration of peripheral macrophages into the CNS (22). Because GM-CSF peaks in the CNS just before or at disease onset (Fig. 1⇑), these data support a role for encephalitogenic T cell-derived GM-CSF in the activation of microglial cells. Indeed, when EAE was induced with GM-CSF-deficient T cells, microglial cell activation was attenuated (Fig. 3⇑). Several in vitro studies, including our own, using ex vivo isolated or cultured microglial cells have shown that GM-CSF promotes their activation as determined by the up-regulation of MHC and costimulatory molecules (9, 10, 11, 30). In particular, GM-CSF was shown to be required for the up-regulation of B7 (10), a finding consistent with our study showing that GM-CSF−/− T cells failed to promote the up-regulation of B7.2 or CD40 on microglial cells during EAE (Fig. 4⇑). In vitro studies have suggested a multistep process for microglial cell activation (10); however, this process has never been demonstrated in vivo. We have recently proposed a two-step model of microglial cell activation in vivo during EAE (32). In the first step, we proposed that IFN-γ and GM-CSF were required for the initiation of microglial cell activation, resulting in increased expression of CD45 and the up-regulation of MHC class II, CD40, and B7.2 (32). We showed that this intermediately activated microglial cell underwent a second step of activation via a CD40 signal to complete the activation process, further up-regulating MHC class II and costimulatory molecule expression. In our current study, we provide evidence that GM-CSF is definitively required for the first step of microglial cell activation. This is shown in Figs. 3⇑ and 4⇑ as the lack of increased CD45, CD40, and B7.2 expression in the absence of GM-CSF. Without GM-CSF, the microglial cells were unable to differentiate into effective APC and, if they presented Ag, would likely deliver a tolerogenic signal due to the lack of costimulation. In our original study, we showed that encephalitogenic T cells express CD40L in the CNS during EAE (32), and, in this study, we show that encephalitogenic T cells are the cellular source of GM-CSF. These cumulative data suggest that the autoreactive Th1 alone has the effector function to enter the CNS microenvironment and orchestrate the initiation and propagation of inflammation associated with MS. In addition to microglial cell activation, GM-CSF has the potential to modulate the function of both macrophages and dendritic cells in the CNS. 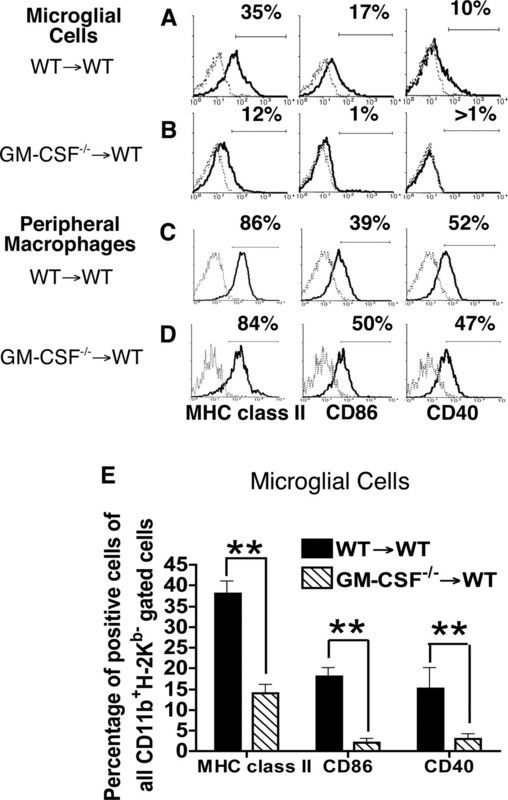 We did not observe a difference in the expression of activation markers in the peripheral macrophage population in the CNS of mice transferred with WT vs GM-CSF−/− T cells (Fig. 4⇑), indicating that encephalitogenic T cell-derived GM-CSF is not required for their activation. In addition, because EAE was not altered in GM-CSF−/− mice (Fig. 1⇑), other cellular sources of GM-CSF are likely not required for macrophage activation. GM-CSF has been shown to promote the differentiation of microglial cells into CD11c+ dendritic cells (30, 33), and dendritic cells have been shown to be in inflammatory lesions in the CNS (22). In addition, perivascular dendritic cells in brain tissue have been shown to be sufficient for Ag presentation mediating the development of EAE (34). Thus, an additional function of GM-CSF may include facilitating dendritic cell Ag presentation. Because microglial cell Ag presentation is not required for EAE onset, and a requirement for activated microglial cells in EAE pathogenesis was recently demonstrated (13), the function of activated microglial cells in EAE and MS pathogenesis still remains enigmatic. To further demonstrate that priming of CNS myeloid lineage cells is required for EAE onset, we administered LPS i.c. on the day of EAE induction. LPS resulted in the activation of microglial cells and circumvented the encephaliogenic T cell-derived GM-CSF requirement. These data indicate that the priming of the CNS microenvironment along with the presence of activated autoreactive T cells is required for the onset of CNS autoimmunity. LPS binds to TLR4 (20, 21), expressed by CNS myeloid cells, including microglial cells (17). In addition to directly activating the CNS myeloid cells via TLR4, the LPS effect could also be mediated through the up-regulation of GM-CSF (35). We think this is unlikely, because we did not detect an increase in GM-CSF message in the CNS following LPS injection. Finally, direct stimulation of microglial cells by TLR ligands such as LPS or CpG ODN could circumvent the requirement for GM-CSF by activating and recruiting peripheral dendritic cells and monocytes/macrophages into the CNS. Thus, we propose that an infection with the capacity to activate microglial cells predisposes an individual to either the onset of MS or clinical relapses. This would include viral as well as Gram-negative bacterial infections, because microglial cells have been shown to express TLR for both RNA and DNA viruses (17). Indeed, viral infections in MS patients have been shown to be associated with both onset and clinical exacerbation of MS (36). In this study, we definitively identify the cellular source of GM-CSF required for the onset of EAE as the encephalitogenic T cell itself. In addition, we show that a prominent cellular target of the GM-CSF are microglial cells. Finally, we show that an important function of GM-CSF is to prime the CNS microenvironment. GM-CSF as a therapeutic target has been suggested for a variety of diseases, including MS. Our data further support this premise and provide evidence that blocking of a single cytokine, GM-CSF, could prevent or even control CNS inflammation mediated by Th1 cells. We thank Shelley Morris-Islo for assistance with the mice and Yanping Tan for technical assistance. ↵1 This work was supported by Research Grant RO1 NS46662-01A1 and the BloodCenter of the Wisconsin Research Foundation. ↵3 Abbreviations used in this paper: MS, multiple sclerosis; EAE, experimental autoimmune encephalomyelitis; MOG, myelin oligodendrocyte glycoprotein; i.c., intracranially; MBP, myelin basic protein; BM, bone marrow; ODN, oligodeoxynucleotide; WT, wild type; HPRT, hypoxanthine phosphoribosyltransferase. McQualter, J. L., R. Darwiche, C. Ewing, M. Onuki, T. W. Kay, J. A. Hamilton, H. H. Reid, C. C. Bernard. 2001. Granulocyte macrophage colony-stimulating factor: a new putative therapeutic target in multiple sclerosis. J. Exp. Med. 194: 873-881. Burgess, A. W., D. Metcalf. 1980. The nature and action of granulocyte-macrophage colony stimulating factors. Blood 56: 947-958. Stanley, E., G. J. Lieschke, D. Grail, D. Metcalf, G. Hodgson, J. A. Gall, D. W. Maher, J. Cebon, V. Sinickas, A. R. Dunn. 1994. Granulocyte/macrophage colony-stimulating factor-deficient mice show no major perturbation of hematopoiesis but develop a characteristic pulmonary pathology. Proc. Natl. Acad. Sci. USA 91: 5592-5596. Fleetwood, A. J., A. D. Cook, J. A. Hamilton. 2005. Functions of granulocyte-macrophage colony-stimulating factor. Crit. Rev. Immunol. 25: 405-428. Hamilton, J. A.. 2002. GM-CSF in inflammation and autoimmunity. Trends Immunol. 23: 403-408. Marusic, S., J. S. Miyashiro, J. Douhan, 3rd, R. F. Konz, D. Xuan, J. W. Pelker, V. Ling, J. P. Leonard, K. A. Jacobs. 2002. Local delivery of granulocyte macrophage colony-stimulating factor by retrovirally transduced antigen-specific T cells leads to severe, chronic experimental autoimmune encephalomyelitis in mice. Neurosci. Lett. 332: 185-189. Raivich, G., R. Banati. 2004. Brain microglia and blood-derived macrophages: molecular profiles and functional roles in multiple sclerosis and animal models of autoimmune demyelinating disease. Brain Res. Rev. 46: 261-281. Guillemin, G. J., B. J. Brew. 2004. Microglia, macrophages, perivascular macrophages, and pericytes: a review of function and identification. J. Leukocyte Biol. 75: 388-397. Aloisi, F., R. De Simone, S. Columba-Cabezas, G. Penna, L. Adorini. 2000. Functional maturation of adult mouse resting microglia into an APC is promoted by granulocyte-macrophage colony-stimulating factor and interaction with Th1 cells. J. Immunol. 164: 1705-1712. Matyszak, M. K., S. Denis-Donini, S. Citterio, R. Longhi, F. Granucci, P. Ricciardi-Castagnoli. 1999. Microglia induce myelin basic protein-specific T cell anergy or T cell activation, according to their state of activation. Eur. J. Immunol. 29: 3063-3076. Re, F., S. L. Belyanskaya, R. J. Riese, B. Cipriani, F. R. Fischer, F. Granucci, P. Ricciardi-Castagnoli, C. Brosnan, L. J. Stern, et al 2002. Granulocyte-macrophage colony-stimulating factor induces an expression program in neonatal microglia that primes them for antigen presentation. J. Immunol. 169: 2264-2273. Carson, M. J.. 2002. Microglia as liaisons between the immune and central nervous systems: functional implications for multiple sclerosis. Glia 40: 218-231. Heppner, F. L., M. Greter, D. Marino, J. Falsig, G. Raivich, N. Hövelmeyer, A. Waisman, T. Rulicke, M. Prinz, J. Priller, et al 2005. Experimental autoimmune encephalomyelitis repressed by microglial paralysis. Nat. Med. 11: 146-152. Jack, C., F. Ruffini, A. Bar-Or, J. P. Antel. 2005. Microglia and multiple sclerosis. J. Neurosci. Res. 81: 363-373. Sedgwick, J. D., S. Schwender, H. Imrich, R. Dörries, G. W. Butcher, V. ter Meulen. 1991. Isolation and direct characterization of resident microglial cells from the normal and inflamed central nervous system. Proc. Natl. Acad. Sci. USA 88: 7438-7442. Hickey, W. F., H. Kimura. 1988. Perivascular microglial cells of the CNS are bone marrow-derived and present antigen in vivo. Science 239: 290-292. Chakravarty, S., M. Herkenham. 2005. Toll-like receptor 4 on nonhematopoietic cells sustains CNS inflammation during endotoxemia, independent of systemic cytokines. J. Neurosci. 25: 1788-1796. Montero-Menei, C. N., L. Sindji, A. Pouplard-Barthelaix, F. Jehan, L. Denechaud, F. Darcy. 1994. Lipopolysaccharide intracerebral administration induces minimal inflammatory reaction in rat brain. Brain Res. 653: 101-111. Poltorak, A., X. He, I. Smirnova, M. Y. Liu, C. Van Huffel, X. Du, D. Birdwell, E. Alejos, M. Silva, C. Galanos, et al 1998. Defective LPS signaling in C3H/HeJ and C57BL/10ScCr mice: mutations in Tlr4 gene. Science 282: 2085-2088. Qureshi, S. T., L. Lariviere, G. Leveque, S. Clermont, K. J. Moore, P. Gros, D. Malo. 1999. Endotoxin-tolerant mice have mutations in Toll-like receptor 4 (Tlr4). J. Exp. Med. 189: 615-625. Ponomarev, E. D., L. P. Shriver, K. Maresz, B. N. Dittel. 2005. Microglial cell activation and proliferation precedes the onset of CNS autoimmunity. J. Neurosci. Res. 81: 374-389. Huffman, J. A., W. M. Hull, G. Dranoff, R. C. Mulligan, J. A. Whitsett. 1996. Pulmonary epithelial cell expression of GM-CSF corrects the alveolar proteinosis in GM-CSF-deficient mice. J. Clin. Invest. 97: 649-655. Dittel, B. N., R. M. Merchant, C. A. Janeway, Jr. 1999. Evidence for Fas-dependent and Fas-independent mechanisms in the pathogenesis of experimental autoimmune encephalomyelitis. J. Immunol. 162: 6392-6400. Takeshita, S., F. Takeshita, D. E. Haddad, N. Janabi, D. M. Klinman. 2001. Activation of microglia and astrocytes by CpG oligodeoxynucleotides. NeuroReport 12: 3029-3032. Ponomarev, E. D., M. Novikova, M. Yassai, M. Szczepanik, J. Gorski, B. N. Dittel. 2004. γδ T cell regulation of IFN-γ production by central nervous system-infiltrating encephalitogenic T cells: correlation with recovery from experimental autoimmune encephalomyelitis. J. Immunol. 173: 1587-1595. Dittel, B. N., D. B. Sant’Angelo, C. A. Janeway, Jr. 1997. Peptide antagonists inhibit proliferation and the production of IL-4 and/or IFN-γ in T helper 1, T helper 2, and T helper 0 clones bearing the same TCR. J. Immunol. 158: 4065-4073. Ponomarev, E. D., B. N. Dittel. 2005. γδ T cells regulate the extent and duration of inflammation in the central nervous system by a Fas ligand-dependent mechanism. J. Immunol. 174: 4678-4687. Shriver, L. P., B. N. Dittel. 2006. T-cell-mediated disruption of the neuronal microtubule network: correlation with early reversible axonal dysfunction in acute experimental autoimmune encephalomyelitis. Am. J. Pathol. 169: 999-1011. Ponomarev, E. D., M. Novikova, K. Maresz, L. P. Shriver, B. N. Dittel. 2005. Development of a culture system that supports adult microglial cell proliferation and maintenance in the resting state. J. Immunol. Methods 300: 32-46. Wada, H., Y. Noguchi, M. W. Marino, A. R. Dunn, L. J. Old. 1997. T cell functions in granulocyte/macrophage colony-stimulating factor deficient mice. Proc. Natl. Acad. Sci. USA 94: 12557-12561. Ponomarev, E. D., L. P. Shriver, B. N. Dittel. 2006. CD40 expression by microglial cells is required for their completion of a two-step activation process during central nervous system autoimmune inflammation. J. Immunol. 176: 1402-1410. Santambrogio, L., S. L. Belyanskaya, F. R. Fischer, B. Cipriani, C. F. Brosnan, P. Ricciardi-Castagnoli, L. J. Stern, J. L. Strominger, R. Riese. 2001. Developmental plasticity of CNS microglia. Proc. Natl. Acad. Sci. USA 98: 6295-6300. Greter, M., F. L. Heppner, M. P. Lemos, B. M. Odermatt, N. Goebels, T. Laufer, R. J. Noelle, B. Becher. 2005. Dendritic cells permit immune invasion of the CNS in an animal model of multiple sclerosis. Nat. Med. 11: 328-334. Burgess, A. W., J. Camakaris, D. Metcalf. 1977. Purification and properties of colony-stimulating factor from mouse lung-conditioned medium. J. Biol. Chem. 252: 1998-2003. Sibley, W. A., C. R. Bamford, K. Clark. 1985. Clinical viral infections and multiple sclerosis. Lancet 1: 1313-1315.